Bring all new flavors to your specialty drink menu with this Torani watermelon flavoring syrup! This tempting flavor will complement your beverages without overpowering them or being too sweet, while the user-friendly bottle will be convenient for your busy baristas to use. Torani flavoring syrups are specially formulated to resist curdling in milk and to hold up well under heat, making them the perfect choice for espresso-based drinks, brewed coffee or tea, and more. Use this flavor for frappes, iced coffees, smoothies, and even baking! This tastes just like the Monin watermelon syrup. It's a slightly different texture - a bit thinner - but Still makes an amazing watermelon Martini. My next project is to use it to make a lemon sherbet float. This flavor was what we were missing on our bubble tea bar. 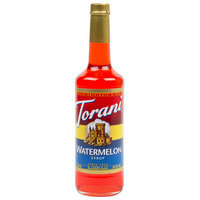 We love the torani flavoring syrups and this taste just like watermelon! Italian sodas, bubble teas and even shakes taste great with this flavor additive! We highly recommend Torani and Webstaurant.com is the place to buy it. We sell flavored Red Bull at our store and we highly recommend Torani for your flavoring needs. It is by far the best flavoring around. Great quality watermelon flavor! I could not be happier with it. So far I have tried it with sparkling soda, green tea and made ice pops. Of all the Torani syrups, this one impressed me the least. It's still okay, but the flavor is much weaker than the other syrups. Definitely has a watermelon flavor, but needs a bit more. Torani always has the best tasting flavors and watermelon may be one of the best! Very natural taste and mixed well with our sparkling lemonade. freSweet summer in your cup. Whether you put this watermelon in black or green tea or blend it up into a frappe you can't go wrong with this watermelon syrup. Fresh and fruity. We love Italian sodas but can never find a good (or reasonably priced) one here in town. They are so easy to make at home but the limited flavor options available at most grocery stores leave you craving more variety. Like all Torani syrups, the flavor on this one is spot on and delicious, it has good texture and is easily dissolved when you're working with it. Watermelon syrup didn't taste as expected, but it's still delicious! It tastes more like a watermelon-flavored lollipop than anything. And I love it, especially with green apple or huckleberry! The watermelon fruit syrup is sweet and fruity and very delightful. A great syrup for making smoothies and flavoring Italian ice and our gourmet lemonade. This watermelon flavor is so refreshing, especially in the summer, and pairs so wonderfully with my other flavors. That, combined with Torani's high quality and low price makes this a winner every time! I would say 1 out of 3 people who order a Italian soda want watermelon. The syrup is delicious but it takes a little more to pop. We have used Torani syrups and flavors for over 2 years. This watermelon flavoring is delicious and works well with refreshing sodas and creamy thick milkshakes. I used this in a watermelon milkshake and the customer loved it! They said it tastes just like watermelon and I can't wait to use this in summer lemonades! I've been told a number of times from our customers that they cant find watermelon flavored drinks very many places. It makes a tasty Italian Cream Soda! Our favorite Mexican restaurant has incredible watermelon margaritas. I couldn't wait to recreate them at home. Torani's Watermelon Flavoring / Fruit Syrup is just what I needed to make it perfect. This watermelon syrup is great to use in italian sodas for a fun summer flavor. This flavor is really popular with the younger crowd for using it for steamers too! A nice sweet flavoring syrup that is perfect for summer margaritas. The watermelon flavor is real and not overpowering. A great buy for our tiki bar. This is an excellent flavor to have on hand - it's not very common and lends it self well to fun and springy mixed drinks - excellent in Fresca and Sprite for a fun twist on a simple soda. I love watermelon so I bought this to mix in mineral water for Italian soda. I absolutely loves it! It isn't too syrupy like other brands I have tried. A little goes a long way! I really like the flavor of this syrup. It's so delicious and summery. Tastes like artificial watermelon but who doesn't like watermelon flavored candy? I've tried this flavor in soda and enjoyed it. Although I did find it to be too mild. By the time I achieved the strength I desired the drink was too sweet. It is not summertime unless you have watermelon everything in your diner. I love the fresh taste of this syrup and love mixing it into our lemonades, daiquiris, and martinis, Your customers will love the watermelon flavor of this mix. This super sweet flavor taste exactly like summer on the porch with a slice of melon....without a wierd after taste like most syrups. Torani is the best of the best when it comes to flavors. We use this flavoring to change up regular white soda. It also makes a pretty color of you are going for a color scheme for a party. This is a delicious flavor and great for italian sodas or watermelon iced teas or lemonades. Will definitely be ordering it again as the need arises. If you want a little something different for your lemonade.......you have found it! This adds just enough sweetness that it counteracts the tartness of lemonade! It turns it into a whole new beverage! I highly recommend! Watermelon was very good. Mixes well with watermelon flavored vodka. You can make martinis, add redbull, or sprite. Probably could use it to make great margaritas too! Frozen or iced. This syrup is best as an Italian soda -- check out the easy recipe below! Watermelon Italian Soda ingredients: 2 tbsp (1 oz) Torani Watermelon Syrup 1 cup (8 oz) sparkling water Ice Instructions: Pour sparkling water into tall glass filled with ice. Add Torani and stir well. Have used this very little. We have made great non-alcoholic beverages using this syrup, but we have also made very bad ones as well. We are still trying to figure out how to use this in a sorbet base, but fresh seems to taste better every time. Mix this up with some lemonade for a delightful summer treat. We used in with several other flavors for a lemonade bar at a wedding. It was a hit. I love love love watermelon but can't tolerate the real thing anymore but oddly I can eat watermelon flavored foods so gave this a try. Was good in my plain yogurt! The Torani Peach Flavoring Syrup doesnt get any better! Watermelon is an all time favorite and for good reason! It tastes great and makes great drinks! Great when mixed with mint. Makes a great French soda. The price is awesome. If you ever tired to shop on line for syrup this website is the cheapest. We really like this watermelon syrup from Torani. We love Torani products period but this one is great. Taste like watermelon and we love it in our lemonade! The flavor is bold and sweet with a hint of sour and tastes great in any soda. I recommend it to anyone who likes watermelon flavoring. The watermelon (as well as every Torani flavor) is just delicious! The screw cap and steady bottle keeps everything nice and neat. I really enjoyed the syrup over a snow cone. Torani's Watermelon flavored syrup is delicious in an italian soda, iced tea, or even jut as a splash added to an iced water. It is refreshing and tasty. The Watermelon flavoring is very refreshing. It goes great in our lemonade and in our mixed drinks. This is one item we will be ordering often. This watermelon flavoring is so good! We run it as a special in the summer in iced tea and lemonade and it is a huge hit! I will be back for more! Watermelon is one of our most popular flavors at our store. We have only been able to find it time and time again at Webstaurant. Definitely the go-to place for price and selection. Delicious! I love that I can find these on your site. It was shipped carefully wrapped in bubble wrap to cradle the glass bottle and keep it safe. It has the flavor just more or less faint. Once I add some citric acid to the drink, it brings it back up to where I expected it to be. By itself it's OK but with some Citric acid it reminds me of a soda that's no longer being made. It's still a flavor I'd probably order again. I really like the watermelon flavour of Torani Watermelon. It is refreshing in Italian sodas and excellent over shaved ice. Its also great for making watermelon flavoured drinks. We love this yummy and pretty flavor!! We use it for our Italian sodas mostly. It makes them look so summer-y and refreshing! The kiddos love them!